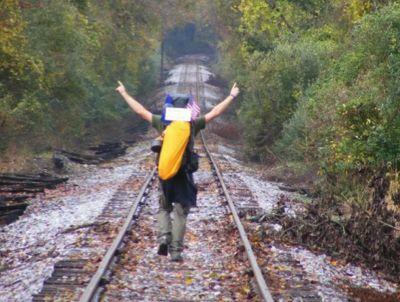 At age 23 Andrew Forsthoefel set out to walk across America. Andrew Forsthoefel set out at age 23 to walk across America, east to west, 4000 miles, with a sign on him that said, "Walking to Listen." The public is invited to the premiere of "Walking Across America: Advice to a Young Man." This hour-long audio program, co-produced with Jay Allison, tracks Andrew's epic journey. It's a coming-of-age story, and a portrait of this country - big-hearted, wild, innocent, and wise. Wednesday April 3, 7:30pm, at Woods Hole Community Hall. Admission is free. With Jay Allison, Atlantic Public Media, and WCAI. On Morning Edition, WCAI's Dan Tritle talked to Andrew about his trek. Listen to the hour-long piece "Walking Across America: Advice to a Young Man" and find out more at Transom.org.